Revolution-ary! Entertaining powerful politicised one-woman tribute to the great musician, composer and civil rights activist Nina Simone delivered by the Olivier award nominated Josette Bushell-Mingo OBE. Josette combines song, dance and story supported only by her band, three phenomenal musicians, standing on a bare stage with a backdrop that serves as a screen playing out scenes of Nina, the 60’s and Josette. The play has rage and adulation and fear that change is not here. Opening with the song Revolution, as the audience enjoys her powerful voice the music is cut dead and the story begins, Josette describes the story of the revolution “like a car stuck in the mud where the wheels kept turning”. The “revolution” takes us through the political 60’s, then abruptly back to the present day with accounts of the USA police shootings, stamping her feet slowly, 16 times to mark the number of bullets used to kill 17 year old Laquan McDonald in 2014. She recounts her first encounter with Nina in a time where seeing another black face on television created an instant connection: a young Josette felt Nina was singing just for her, in time where blackface was allowed. Using songs and accounts from her life and Nina’s life that connects them and drives story, the 1969 song Revolution by the American jazz musician Nina Simone and Weldon Irvine evokes questions: The word revolution evokes questions and she throws this question to the audience. “How the f___,did we come to a time where we have to say Black Lives Matter?”. Josette wants to know where did the revolution go that Nina started with her songs in the 60’s. It’s more than just evolution/Well you know you got to clean your brain /The only way that we can stand in fact/ Is when you get your foot off our back. There are moments when Nina and Josette become uniform singing songs like Feeling Good, she says “I’m her understudy”. Donning the Afro wig symbolic of the 60’s and Nina, Josette brings it. It is a big show that addresses big issues which Josette is not afraid to address. The concept of revolution is “turn around” each unique to time and place not following a single plan or model. Which is the “style” of the show she throws in America’s race wars, the four little girls in Alabama in 1963 which inspired Simone’s Mississippi Goddam. A song that Nina claimed caused the music industry to reprimand her by boycotting her records and many saw as a call to arms. Although a fan and friend of Martin Luther King Simone did not “adopt” his peaceful approach. 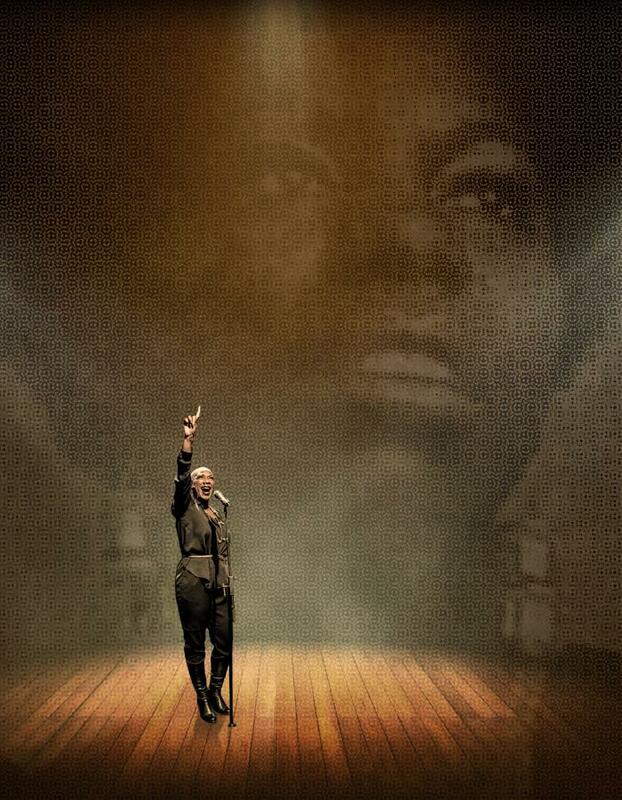 Can the revolution that Nina Simone started and that Josette is searching for be standing right there in plain sight, on that stage: a black woman with a sell-out one woman show not afraid to address a mostly white audience about “issues” that we rather not talk about. If you are wondering if all the singing is there to soften the blow, if you are, then maybe you just did not get it or the enormity of the message. About Nina Simone: Born in 1933, she is best known for her talents as a Singer/Songwriter covering genres from Blues and Jazz, to Gospel and Pop. She is also known for her work as a Civil Rights Activist. Nina who died in 2003 wanted to become the first black classical pianist but instead gained fame as a singer of the blues. Released in 1967 Bashlash Blues was just one of Nina civil right songs penned by her friend Langston Hughes. “But the world is big / Big and bright and round / And it’s full of folks like me / Who are black, yellow, beige and brown / Mr. Backlash/ I’m gonna leave you /With the backlash blues”. In 1999 Nina told Tim Sebastian on BBC Hardtalk when asked about her songs being political weapons that “protest songs help to change the world”.